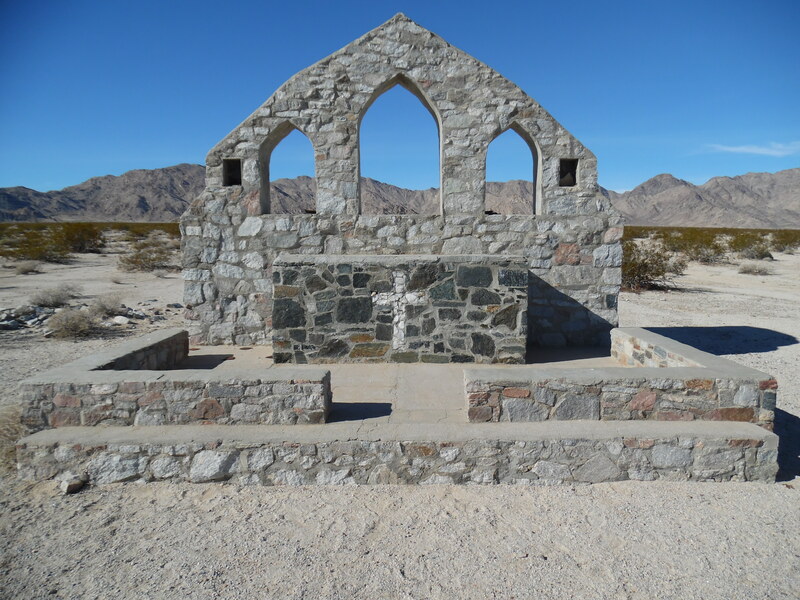 My first idea was to try to get to McCoy spring, not very far north of I-10 if our road is open past the rest stop. So we go to the rest stop, enjoy the wifi on our cell phones, and discover that the solar power plant has apparently managed to close down all access to the area north of the freeway. So on to plan B.
Larry suggests going back to Iron Mountain Camp, part of Gen. Patton’s Desert Training Center during WWII. We first found it more than 20 years ago, so maybe it is time to go back. 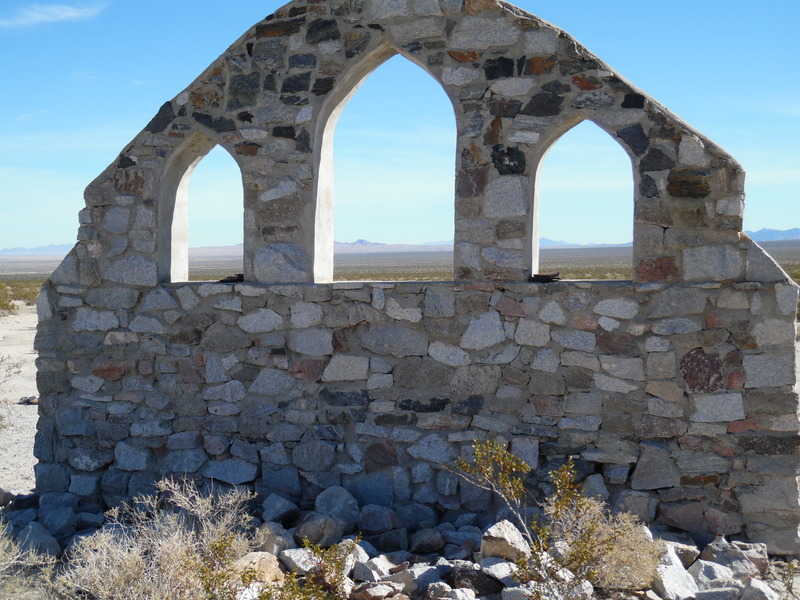 We make the 20 mile trip to Desert Center by freeway and go north between the Coxcomb Mountains, the barest, raggediest mountains in this area, and the Palen-McCoy Wilderness which should be great to explore. If there were any access. The one road that goes across is probably more than 40 miles of really bad road and not exactly what our poor truck or our aging bones need. So we stay on the pavement until the highway joins state highway 62. Shortly after we swing right on 62, we start looking for the signs. They used to be here, one on either side of the highway. On the south side was Iron Mountain Camp, on the north Granite Mountain. No, Larry says it’s the other way around. Long story short…he’s right. Apparently we can’t get to the one on the south any more so we find the really squishy sandy “road” to Iron Mountain on the north side and wallow our way to a fence. Hm…where’s the fenced-in topo map? Where is the chapel? We should be able to see the chapel from here if nothing else. Nothing looks familiar. We hang a left and wallow some more to the end of the fence going probably south-west. By the time we’re most of the way to the corner, we have spotted the chapel. So at the end of the fence we ease the truck around another corner, right this time, and bump our way to the end of that fence. For more than 20 years, we have enjoyed the picture we took of this “chapel”. Our daughter had purloined the print and taken it to some gift shop in the mall where they blew up the picture, cut it in a circle, and put it into a battery-operated clock which has survived trips in all the RV’s we’ve had since. But guess what? The picture in the clock is of the back of the “chapel”. We had completely forgotten what the front looks like. The whole chapel was open-air and the worshipers stood in the rectangular areas. The weather is still too chilly for dining al fresco, so we munch our sandwiches in the warmth of the truck and head back down the sandy roads. The view from that high on the bajada is marvelous. There is no haze and we can see far-off mountain ranges, a line of cars parked on an abandoned railway, the Colorado River Aqueduct, and a few roads running in straight lines to who-knows-where. We talk about all the walking we did at this site, trying to find the topo map. We learned so much about Patton’s camps from exploring here…and from the numerous camps we’ve visited since…that the whole subject is one that still interests even me. Surely the fenced-in map must still be there. How could I mis-remember so much about this place? And if the map is where we think it is, do either of us really want to hike that far again? Our legs are 20-some years older now and not as eager for such treks. Another close look with the binoculars finally straightens out some of my memory cells. It IS where I remember it. And it IS farther than I want to slog through soft sand to get to. How I wish I could have seen the map in its heyday. 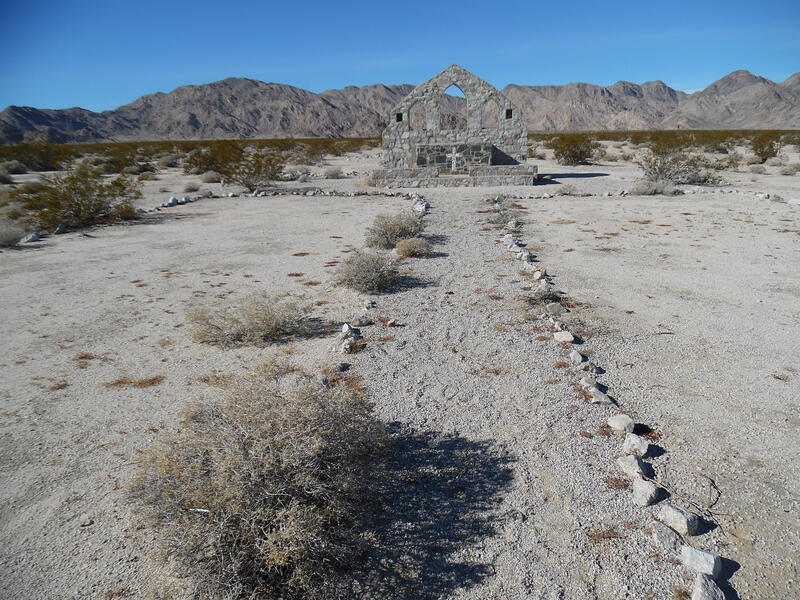 It covered two acres or more and represented all of the desert from Chiriaco Summit on what is now I-10 (Patton’s headquarters) east to the Colorado River, and extended north to the old US 66 (currently I-40) and south to the Mexican border. Rivers, washes, highways, railroads, settlements, mountains, and valleys were all shown in relief and above it all were walkways where the officers could gather and plan their strategies. I have not seen any pictures of it, only descriptions. It was unprotected for years, so a lot of vandalism, both deliberate and inadvertent, has destroyed most of the details. Slowly we eased our way back to the highway and on east to Rice. There isn’t anything at Rice any more, but we remember when there was a gas station, store, and shade trees for the weary traveler. There were also two of Patton’s camps just to the east of Rice and the air strips there are still visible. We decide to take the Rice-Midland Road back to Blythe. It is not paved and signs warn that it is a sandy desert road, but it is well graded, not heavily traveled, and a real pleasure to drive. It is the one I described on February 4, 2013 when we drove it the other direction. We made good time and enjoyed seeing again the ghost railroad we had followed on foot for some distance last time. But just before we got there, something caught our eye on the right side of the road. Against some very dark rock were some very light lines…wide, very distinct lines. Lines that don’t appear to be roads or to have any reason for being. These lines seem to make very large, unidentifiable shapes. A quick glance at the map shows that we are a bit northwest of the intaglios north of Blythe, in the same chain of hills. Are these more of those? We have heard of other giant figures in the desert but have never gotten a clear description of their location. These are easy to find, so if they are really intaglios, surely they would be identified as such and protected. Your guess is as good as ours. We have no pictures because the lowering sun was right above the hills in question and washed out any pictures we tried to take. Up over the hill, down past Midland which is now a ghost town itself, we hit pavement again and proceed into Blythe and then home. We’ve covered a lot of miles but it’s been fun and has given us something to think about.